At last, a definitive selection of the elegant work by a poet at the forefront of American poetry for more than three decades. 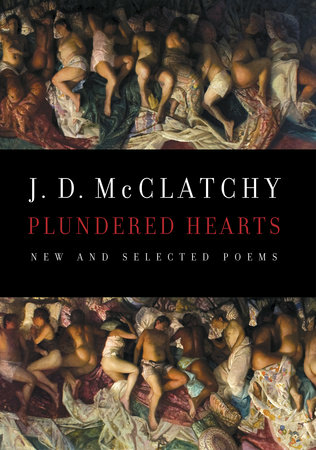 With his first several books, J. D. McClatchy established himself as a poet of urbanity, intellect, and prismatic emotion, in the tradition of James Merrill, W. H. Auden, and Elizabeth Bishop––one who balances an exploration of the underworld of desire with a mastery of poetic form, and whose artistry reveals the riches and ruins of our “plundered hearts.” Now, opening with exquisite new poems––including the stunning “My Hand Collection,” a catalogue of art objects that steals up on the complexity of human touch, and a witty and profound poem entitled “My Robotic Prostatectomy”––this selection is a glorious full tour of McClatchy’s career. It includes excerpts from the powerful book-length sequence Ten Commandments (1998) and his more recent works Hazmat (2002) and Mercury Dressing (2009)—books that explored the body’s melodrama, as well as the heart’s treacheries, grievances, and boundless capacities. All of his poems present a sumptuous weave of impassioned thought and clear-sighted feeling. He has been rightly hailed as a poet of “ferocious alertness,” one who elicits (says The New Leader) “the kind of wonder and joy we experience when the curtain comes down on a dazzling performance.”From the Hardcover edition.